Great stop. Plenty of facilities. Service good. Motorway services are great for travelling - free parking reasonably priced food and choice available with discount offered when using accommodation . Recommended. For disabled visitors. Doors are manual and quite heavy. inside doors were open. Room 1. Door to room very heavy, had to get assistance from willing and helpful receptionists to open door for me. Threshold into bathroom was fairly high and took some effort to get in. bath with shower over. would need assistance to use it..Good heater soon has you warm, telly, wooden floor huge very comfy bed. Overall you get what you pay for. The Isis Budget at Lymm does exactly what it says on the tin. It is basic but provides just what you need when you stop for the night on a motorway: a comfortable bed and plenty of hot water for a bath. I didn't even watch TV! But I woke after a good night's sleep ready to continue with my journey. The staff at check-in and check-out were very friendly and helpful. Highly recommended for a no-frills convenience stop. My partner and i stay here at least twice a year since a few years now whilst travelling from our home in the Scottish Highlands to her family in South Wales and returning. I was a convert to Etap, as Ibis Budget hotels were branded previously, before we were together, i used them regularly as i travelled around the UK for my work. 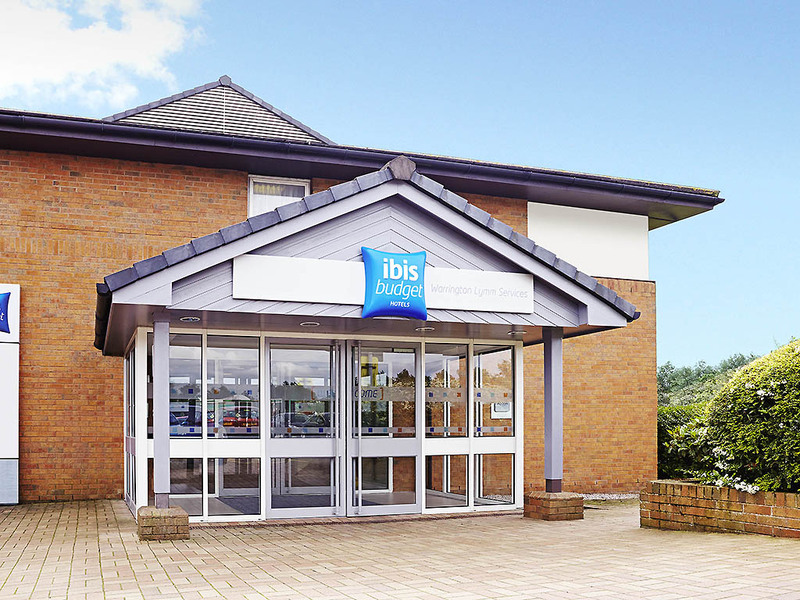 Ibis Budget, Warrington Lymm Services ticks most boxes for me, convenient, helpful professional staff, comfortable...what's not to like ? Whether you arrive with a car or an articulated lorry, they have plenty of properly signed to parking, that can't be said for all UK service areas. Only one piece of constructive criticism preventing me giving five dots, the hotel's due an interior refurbishment, that's in my humble opinion only. We'll certainly be back, God willing. Given that it is sited on a busy motorway service area on the M56 it was definitely budget. Sadly it was lacking in overall cleanliness.Compared to other IBIS budget hotels in europe it was way behind, it has no facilities and the service area facilities were very poor. I stay at the Ibis Hotel Lymm regularly for work, and the accommodation is consistently good. It is basic but well priced. Rooms are clean, quiet and comfortable. There are no tea making facilities in the room but you can buy hot drinks at reception or if you ask they will lend you a kettle, which comes with tea, coffee, sugar and milk. Staff on reception are, without exception, friendly, welcoming and efficient. There are shops nearby, from which you can buy food for an evening meal. At some of these outlets, you can produce your key card and get a 10% discount on any purchases. Free parking is provided. This is not luxurious accommodation, but it is entirely satisfactory for an overnight stay. Clean reasonable and Bug rooms..Friendly staff. ...appreciated a Good toom, Big, Clean, excellent bed. Parking Good. Quiet. Very nice people working there. Cleaning was discreet. Shops to dine or her breakfast are close by. If you enjoy a coffee or extended breakfast... go to Lymm. Beautiful and Charming.... good Food. We have used this hotel before, primarily for it's excellent location and fabulous value for money. Once again a clean and comfortable room, with bath (hooray!). Staff helpful and pleasant throughout. Terrible.... from the outset of the door cards being printed the wrong way so we spent 10 minutes before getting in the room too the dirty, mouldy bath. Carpets full of brown stains walls full of brown sticky stains (tried to wipe with a cloth wouldn't dare touch it with hands) very strange damp/dusky smell in the room heating you had 2 options cook yourself alive or freeze. Pipes made the worst and loudest noise when taps where in use and some other guests inconsiderate of us sleeping banging through at 2am/3am in the morning and staff clearly uninterested. Yes it's on a budget but you could atleast go to aldi and get a few cleaning items!! We were woken up every hour with people shouting through the night we wont be recomending or using this hotel again. Ran a bath checked the water and it was dangerously hot and burnt my hand badly. You could hear all the new arivals and they were noisy 12am-1am-2am3am we were woken up all through the night. If you want a sleeples night then stay here! We stayed here for one night, as my partner had to catch a plane from Manchester Airport, very early the next morning. This was good as it was dog friendly and had places to eat next to it. We just needed a bed for the night, nothing fancy. We would stay here again. Although the building and interior decor are looking tired this motel is really good value for money. The reception staff were all helpful and friendly. A suggestion - in Ibis abroad they have bottles of shower gel attached to the walls- works really well and better than little soaps. We had to make a last-minute, large, family booking here, to attend a funeral nearby. We arrived in the early evening, midweek, having travelled all the way from north-east Scotland in a convoy of cars. We stayed 1 night, in 3 family rooms, on the ground floor and one single room, on the first floor. All the rooms were clinically spartan and minimalistically furnished, with no tea or coffee-making facilities in any of them. There were only adequate towels, a bath mat, a couple of bars of soap and toilet roll suppled and we found the baths both deep and dangerously slippy, particularly for elderly people and children in our party. There were no food or dining facilities in the hotel but, food, drink and additional toiletries are available to purchase at shops outside, a short walk away. As it was pouring with rain when we arrived, this stroll, particularly for the pensioners in our party, was a bit unpleasant. There were a very limited supply of kettles available on request and we encountered a shortage of spare pillows too. The sofabeds were in need of replacement and the functional stools were uncomfortable. The hotel is located beside a huge lorry park, so it was very noisy in the early morning. This necessitated keeping the windows closed overnight, so the rooms were a bit stuffy. We imagine that this requirement would mean the rooms could be stifling in the summer. All that said, reception staff were understanding, welcoming and friendly and the hotel was not expensive. Despite the cheap cost, based on this experience and compared to those we have had in other similar budget accommodation, we would not book this hotel again and would recommend others go elsewhere too, if they can! Ideal location adjacent to the M6. Good quality accommodation, good staff. Excellent food outlets adjacent with 10% discount for hotel guests. Would recommend for overnight stays. Convienent for Potteries, Peak District, Liverpool. Perfect place to stopover between Scotland and London. Next to amenities and close to quaint towns for dinner. Also very close to Manchester airport when you need to drop off someone. Being mid-way between Liverpool and Manchester is also a big plus.